Volkswagen is a manufacturer that's been making a lot of noise recently about its plans for new electric and hybrid vehicles, but one of the first that will actually be seen in action may surprise a few people. That's because it's not a frugal, sensible family car like some might have expected, but instead will be an extremely fast performance model designed to conquer the legendary Pikes Peak International Hill Climb on June 24. The car has been named the ID R Pikes Peak, and as well as putting in a spectacular time at the hill climb event it's also designed to showcase the potential and spectacular performance capabilities of Volkswagen's electric car technology. Although the German automaker isn't going to be offering retail buyers anything with the kind of performance this model will have at its disposal anytime soon, the ID R is still very much a spearhead for the new range of ID road cars that will start to arrive fairly soon. 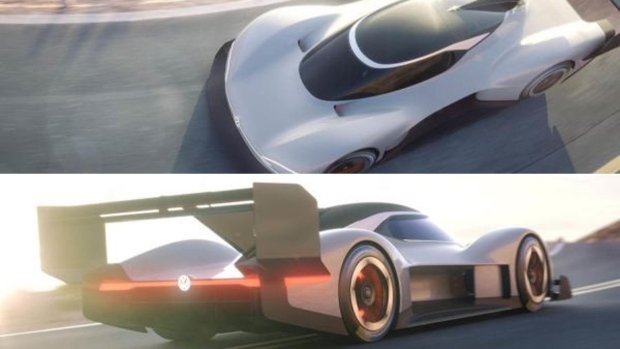 So far, all we have to go on are some official computer-generated images produced by VW showing the pure-electric coupé looking a lot like a modern-day Le Mans prototype. The car boasts aerodynamic styling cues that include a large front splitter, and a central fin that extends right to the rear and seems to be helping support the massive rear wing and a multi-channel diffuser element. Volkswagen Motorsport Director Sven Smeets says of the project: "It is about time we settled the score. The I.D. R Pikes Peak represents an extremely exciting challenge for us, to show what is possible in motorsport with an electric drivetrain. The entire team behind our driver Romain Dumas is highly motivated to set a new record for electric cars." The Pikes Peak hill climb has been held since 1916 near Colorado Springs in the Rocky Mountains. The challenging route of 12.4 miles route begins at just above 9,000 feet and climbs to the summit that sits proudly at 14,115 feet above sea level. At the moment, the record time for the event in the electric prototype class is 8:57.118 minutes, which was set by Rhys Millen from New Zealand in 2016. Frank Welsch, who is Volkswagen's R&D boss and responsible for the upcoming ID road models, says of the event: "We want to be at the forefront of electro mobility with the ID family. Competing in the most famous hill climb in the world with the ID R Pikes Peak not only has symbolic meaning but is also a valuable test for the general development of electric cars."